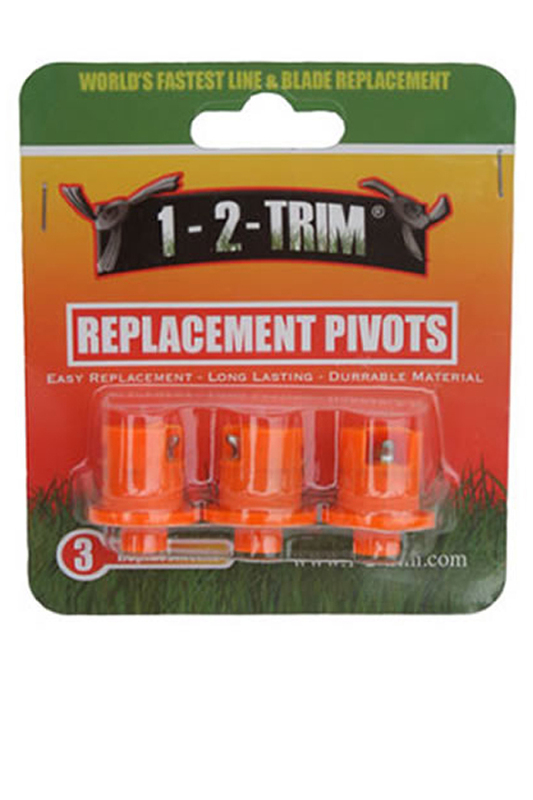 Replacement Pivoting String And Blade Holders For Your 1-2-Trim Trimmer Head. Accidents happen, and parts eventually wear with repeated use. Whether you've logged a ton of hours or you've made a mistake while edging next to some rocks, this pack of parts will help you fix your 1-2-Trimmer head, and get you back to work. It's usually just a single post that goes bad, but many people like to replace them all at once, while others like to be prepared for the next accidental damage by having extras on hand. When the spinning thing that hold the string or blades no longer works for one reason or another, this pack of replacement parts will solve the problem, and allow you to repair your trimmer to make it work like new again. They are easy to install, and they are identical to the part that was pre-installed when the head was new. To fix posts that are worn or broken, you just pop the old one out, and slide in one of these. There are three in each package, so a single purchase will include enough to replace all pivot points on the trimmer head. Easy to replace. With very little time or effort, anyone can restore function by replacing the posts on a broken head. Simply pop the old one out, and then pop a new one in. Long Lasting. Most users will never have a need for this part. For commercial landscapers, or high volume users, an accident might take place, or the head may get used enough to require new posts. For most homeowners, this sturdy part will never need replacing. Durable Materials. Commercial grade materials ensure that these last for a long time, and handle plenty of abuse. Genuine Part For An Exact Fit. Never question the fit or quality when you get parts from us. These posts are guaranteed to fit and function just like the originals because they are genuine replacements. Hard work results in worn parts. Rejuvenate your trimmer head to make it work like new again by replacing the spinning part that holds the string and blades. Order Yours Today! Powerful And Indestructible. The Only Nozzle You'll Ever Need! Lightweight, Compact and Tangle-Proof. A High Quality Hose That Doesn't Kink. Innovative Cord Reel That Solves Tangling & Storage Problems. A Self-Priming Pump. Transfer Any Liquid. Just Jiggle Or Shake To Start The Flow! Replacement Brush Cutting Blades For Your 1-2-Trim Trimmer Head. 100% Stainless steel. Military grade gear that easily stores in wallets, pockets, purses and more.